Heads up, Android users: there's a Google Search update that just landed in the Play Store. Google's tendency for staged rollouts means that some of you might not get an automatic update for a few days, but as usual, we've got the APK download below. There are a few noticeable visible changes in the integrated Google Experience Launcher, but that's about it as far as new features go. This is an incremental update after the massive 3.1.8 update from last month. 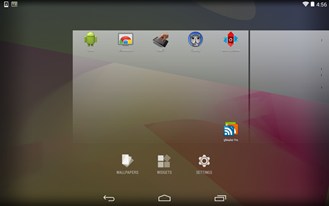 The tricky thing about combining your search and homescreen apps is that now you've got two new things to maintain. 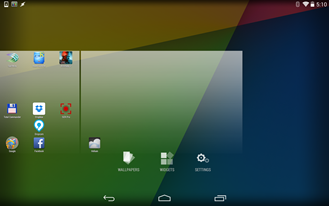 A few Nexus tablet users discovered this after updating to Android 4.4 and finding that the fancy new homescreen had a few issues, notably that the icons and integrated search bar will overlap. 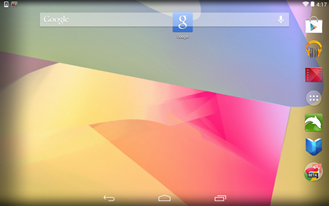 The latest update to Search in the Play Store moves the search function to a more subtle icon on the left edge. Other changes include slightly larger icons on the homescreen, at least for some devices, and the "Settings" icon that appears after a long-press on an empty region of the homescreen has been modified to one gear instead of two. 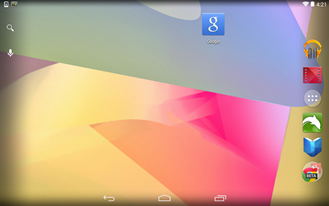 It's more in line with the adjusted aesthetic in KitKat. Our indefatigable teardown team has noticed a few changes in the strings.xml file, most of which look like they're associated with the contact recognition feature. 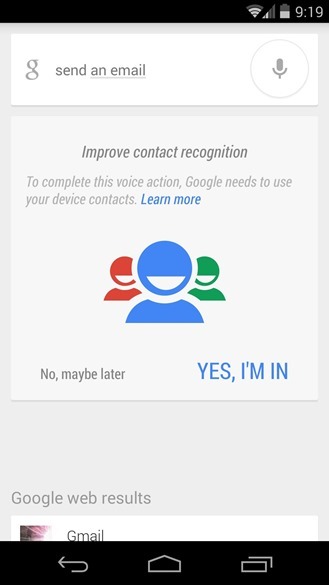 This allows Google Now to more easily associate voice commands with contact names for calls, texts, and the like. This feature has been around for a while, so there aren't any new technical capabilities on display. Contact recognition is on by default in the US, so we're guessing that these additions describe a pop-up menu that's only enabled in certain regions where local privacy law requires it. See this page in Google Now support for details (those settings aren't visible to US users). The opt-in features may not even be enabled yet, but there are many more mentions throughout the underpinnings of the updated app. Update: commenter Jooyoung Hong has seen the info above in the form of a new Google Now card. He's in the United States, so I guess that dashes our regional theory. Thanks, Jooyoung! These seem to be the only major changes in the app, but we're combing through the rest of the code. We'll let you know if we find anything juicy. Thanks, @TheNewsHQ and Steven Zeck!